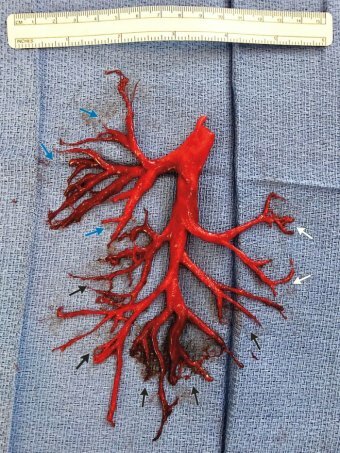 A man has stunned doctors by coughing up a 15-centimetre-wide blood clot from his lungs in the near-perfect shape of his right bronchial tree. It came from a 36-year-old man with end-stage heart failure who spat out the medical anomaly in one piece during an extreme bout of coughing in hospital. Despite the best efforts of intensive care staff at the University of California San Francisco Medical Centre, the man died a week later. “We were astonished,” pulmonary surgeon Georg Wieselthaler told The Atlantic. But blood eventually broke into his lungs and after days of coughing up smaller clots, the patient hawked up the famous one. Doctors speculated the clot stayed intact due to a higher-than-usual concentration of a particular protein component of blood plasma, caused by the man’s infection, which could have made the blood in his airways unusually rubbery. They said it was possible the man was able to cough it up because of its size, rather than despite it, The Atlantic reported. Previous Post The Oscars have become irrelevant. Here’s how ‘Black Panther’ could change that.